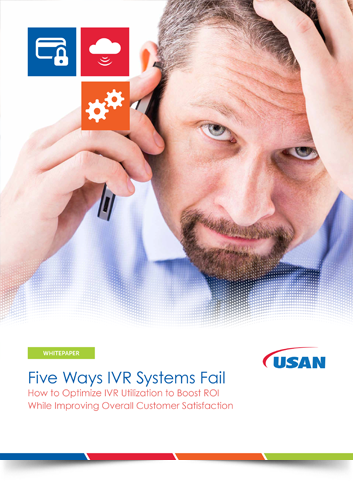 We talk a lot about IVR containment. Containment is a good thing. The fewer people that zero out the better your return on your IVR investment. But there’s one time where containment is not a good thing. When the caller doesn’t want to be contained.Your business success doesn’t depend upon how well you keep customers from talking to agents. It depends on keeping your customers happy. When you make reaching an agent difficult, you’re not doing anyone any favors: not you, not your business and most definitely not your customer. We all know the reasons why people zero out. Not just because we’re in the business. Not just because we’ve read the studies. But also because we use IVRs—we zero out too. And the last thing we want is to get in a fight with an IVR about it. I’ll get to the reasons people zero out in another post. Right now I really only want to make this one point. If the customer wants to talk to an agent, let her. Don’t put obstacles in her way, like disabling zero, or refusing to recognize repeated pressing of non-available keys, or—of course—saying “Agent.” Or making them interact with the IVR in order for you to allow them to speak to someone (“before we connect you with an agent . . . . “). Every second, and I think I mean this literally, that you delay in responding to the customer request to talk to someone is another second of customer dissatisfaction. Of course, when a customer zeros out, you’ve got some work to do afterwards don’t you? You have to find out why that customer wanted an agent; how many customers like that customer go to agents; how many customers with the same intent zero out? I’m going to talk about that next time (spoiler alert: one of the things I’ll suggest is that you ask the customers why they didn’t stay within the IVR). Call containment is definitely cheaper. But it really comes down to a choice doesn’t it? Spend only a dime making the customer angry, or spend a whole dollar making them happy. Not much of a choice.